KitchenAid products are so versatile, it is amazing what you can do with them. What isn’t always amazing is the price tag on many of these kitchen gadgets. If you’ve always wanted a hand blender but didn’t want to shell out over $100 for one, I can’t blame you. Thankfully, you can snag $30 off of the KitchenAid 5-Speed Hand Blender on Amazon right now. 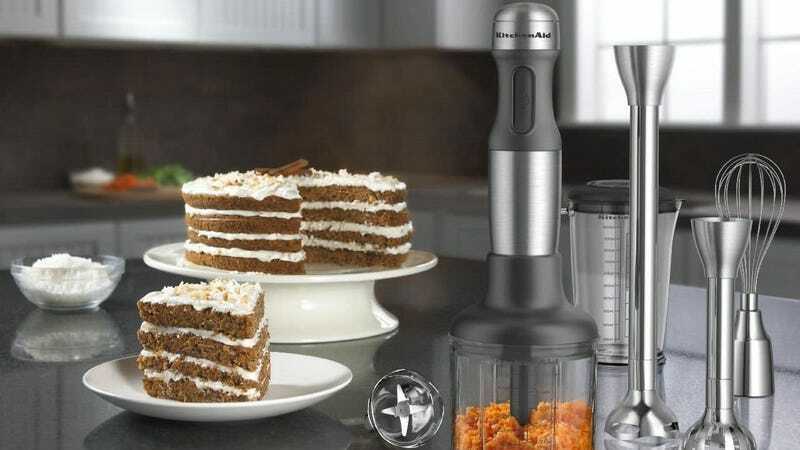 The hand blender set comes with three interchangeable blades, which allows you to use it for a variety of cooking tasks, like crushing ice, pureeing soup, frothing milk, whipping eggs, and more. The set comes with a free blending jar that is perfect to make your morning smoothies. You can even make your own baby food if you aren’t too sleep deprived to man a hand blender!